A passage from the Psalms, expressing the goodness of people living together in unity, set to a popular folk melody. This traditional hymn is sung at the conclusion of Sabbath and Festival services, and affirms the belief in one God. I am my beloved's and my beloved is mine. From the Song of Songs, this song is very popular as a wedding processional. A 16th Century poem welcoming the Sabbath Bride. From Psalm 150, this moving Sabbath melody praises the Creator through song. A gentle Israeli song describing the return of the flocks from the fields at dusk. A lively Hanukkah song about the spinning of the dreidel and the miracle this holiday commemorates. The timeless melody that sets the following words to music: Jerusalem of gold, of copper, and of light, I shall accompany all the songs dedicated to you. A contemporary melody for the Sabbath prayer for peace. 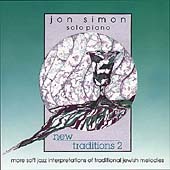 All arrangements performed on a Steinway concert grand by Jon Simon. Recorded and mastered by Joshua Salesin at Warner Concert Hall, Oberlin Conservatory of Music, Oberlin, Ohio.